Big tip of the helmet to Bob MacEwen for raising the bar. Just how fast will these things go? Is 50mph and 100 miles the next goal? Do we remember how hard it was blowing last Saturday? mainsheet no matter what happened, and Lloyd gave me his GPS to carry along so we could verify the readings from my unit. This time I did hold on to the sheet when the boat started hiking and to my relief the boat just stabilized on the lee runner and the sail dumped some air to allow the windward runner to gently come back down on the ice. I did a couple of passes and then stopped to check the readings from both GPS units. 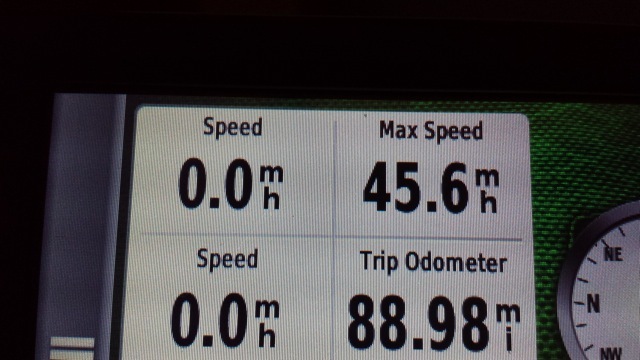 Lloyd’s unit read 45.7 MPH for maximum speed and my unit read 45.6 MPH. I know the DNs, Whizzes, Nites, and many other larger boats regularly go much faster, but 45 MPH on my Cheapskate was plenty fast for me. I spent the rest of the day just screaming around until I just couldn’t hold on any longer. What a Great Day!